ShantiMayi first arrived in India in 1986. While visiting Laxman Jhula in 1988, she met her Guru, Sri Hansraj Maharajji. Upon meeting her, he said “I have been waiting for you for 40 years.” ShantiMayi was thirty eight years old at that time, which means Sri Hansraj Maharajji was waiting for her even before she was born. ShantiMayi was the only Westerner in Laxman Jhula during those years - and was blessed to have the experience of being with her Master, and her practices, in relative seclusion. Sri Hansraj Maharajji was a Universally highly regarded traditional Vedic, Indian Saint - and was the head of the ancient Sacha lineage - which exists solely for the purpose of the enlightenment of all beings. Sri Hansraj Maharajji asked ShantiMayi to return to Oregon after 6 months with Him, and to return to Him in India after 6 months away. During one of these stays in Oregon, whilst working at a factory, she came to the full realization of the essence of Divine nature. She is unified with all - and completely committed her life to the service of All Beings. She soon returned to India to be with her Guru and, with His Blessings, gave her first Satsang in 1994. Though Maharajji left his physical form in 2011, still, every year ShantiMayi has returned to SachaDham Ashram, the home of her Guru. Seekers from around the world come to SachaDham to receive her blessings and satsangs. They might ask whatever questions that may arise from their hearts. ShantiMayi, whose life has included a great deal of travel around the world, eclectically draws upon the quintessence of many traditions: Hinduism, Christianity, Buddhism, and the Aboriginal Tribes of the Americas and Australia. Though this is so, she speaks from her own direct experience as she points each of us back to the Divine within ourselves. 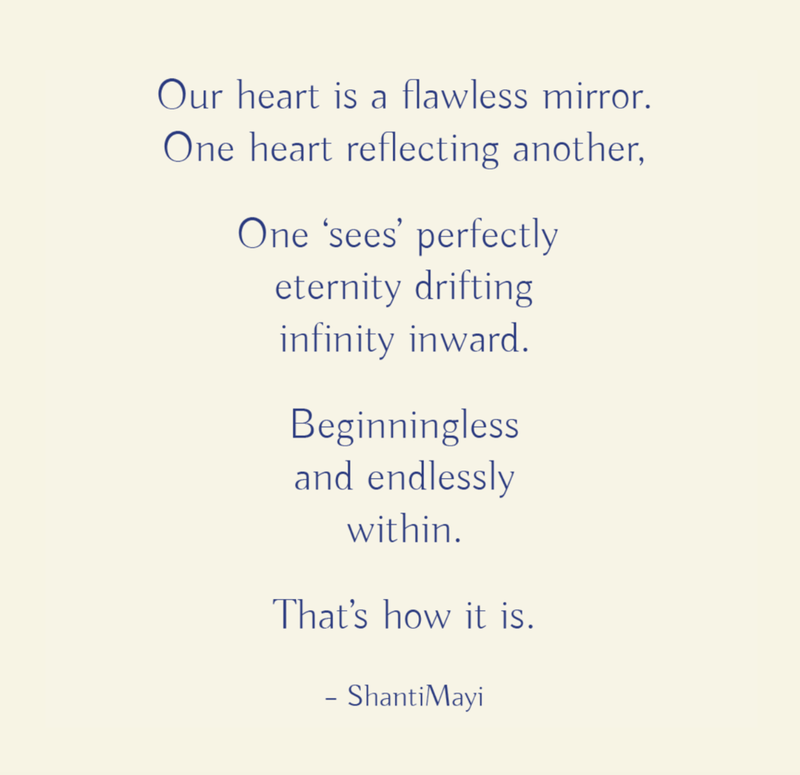 ShantiMayi continually guides us to live for life in integrity with an open heart and open mind. Each moment experienced is (actually) fresh and new, and is (actually) free from our mental projections and self-made difficulties. It becomes possible to realize the deepest peace and stillness from within our selves. Find out about ShantiMayi's travel itinerary throughout the world along with Satsang locations and dates. ShantiMayi is the first westerner as well as the first woman that stands in this eminent line of Sacha Masters. She too has given her life completely to the Sacha Mission of the past Masters. 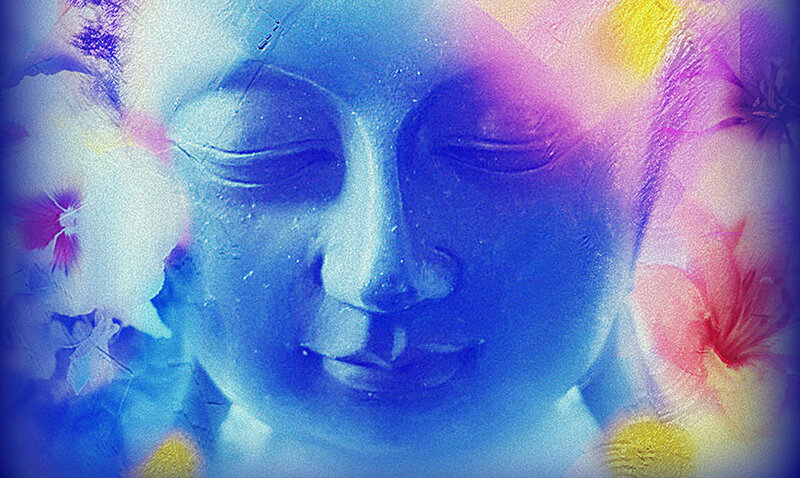 He is a blue-hued Buddha, one of empowerment, embracing aspects of Buddha’s grace in the shape of dynamic healing energies and blessings. Every year ShantiMayi returns to Sachadham Ashram, home of her late master Maharajji - to give Satsang on the banks of the River Ganges in the foothills of the Himalayas. A sanctuary in the heart of the French Pyrenees where over the Summer season ShantiMayi welcomes guests for spiritual teachings, meditation and creativity. People all over the world are chanting this deeply moving prayer at this very same time. No matter what time of day or night you may chant, there are others chanting the mantra too. Check the latest Sacha Sangha news. If you have Sangha news, please write to us and we will post the news. ShantiMayi offers articles, mp3s for guided meditation and talks on spiritual direction.